Apple Iphone 5 LCD/ GLASS replacement repair colour white. Price including install 3 months warranty on all parts. All our parts are AAA quality the best that can be sourced. Free return express postage included. Client is responsible for sending parcel ( we are not liable for lost items in transit to us ) . For all warranty claims post to us and back to you will need to be paid. 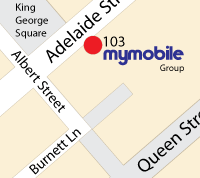 Drop off and pick ups are welcome from our brisbane retail shop 103 adelaide st brisbane city.